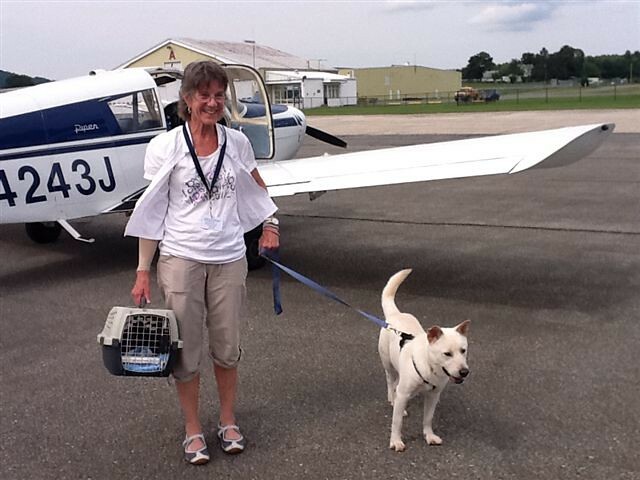 We don't know much about Blanco's life before he ended up at the Pender County Animal Shelter. 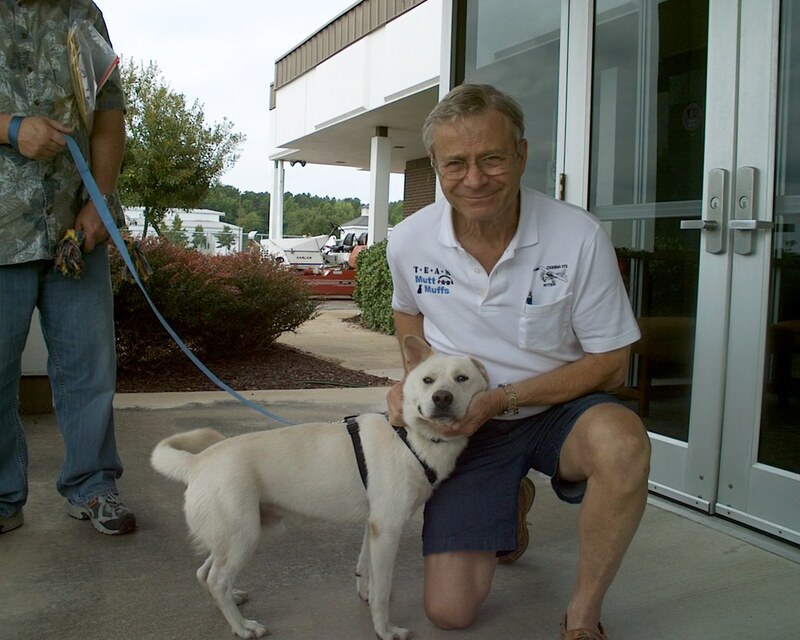 He was brought in as a stray and he had old injuries to his leg and eye that had healed over. He had rope/collar burn around his neck. Not a lot of facts but heartbreaking to think of for a young little guy. Too much bad in his life at such an early age. But what strikes you about Blanco when you meet him is not his limp or his injured eye but his friendliness and his zest for life. It is very easy to bond with Blanco, because he is so welcoming and just so darn cute!! Blanco started out his day on Saturday, Aug 13th like any other day. But little did he know that he would be taking multi-state, first class flights with a full transport staff of several people, kitten traveling companions and onto his very own forever family. Thanks to Michele & John, Elliott & Martha and Margery, this poor little one caught a break finally. Not only did Blanco catch a break but five little helpless kittens' lives were saved because of wonderful, hard-working volunteers, Jeff, Michele & John, Elliott & Martha and Margery. Thank you!! Each of you played such a wonderful role in helping Blanco and the five kitties and I would like to thank each of you for your help. You all the Best!!!! The day starts out early. Five South Carolina kitties get a second chance. 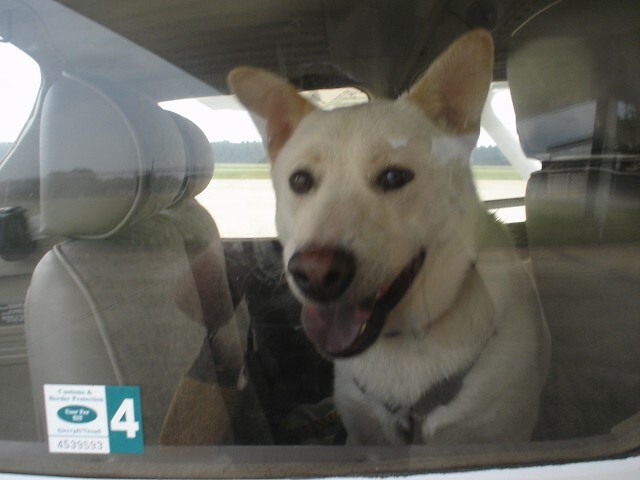 Pilot Jeff flew the gang from Rock Hill, SC to Rocky Mount, NC where Blanco joins the transport. Rescue volunteer John, and the intrepid Mr. Blanco. At some point in his past, one of Blanco's hind legs had been broken. It was never set, but healed on its own. Blanco has a limp now, but that doesn't slow him down. He's a beautiful, loving dog. Little does he know, his life is about to really change. He has a family of his own waiting for him in Massachusetts. 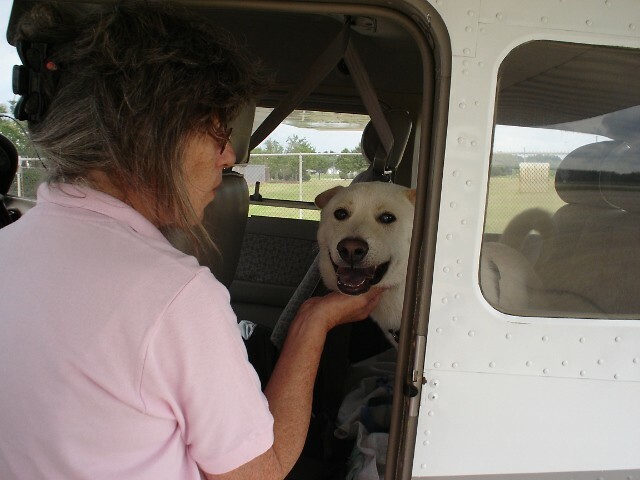 Blanco gets acquainted with Team Mutt Muffs - Co-pilot John. Blanco gives the windows a little doggy snot as he says Thank You and Goodbye to the best people he has ever known in his short life. It was a challenging flight due to weather. We were in the clouds most of the trip, but we managed to stay ahead of all the thunderstorms. 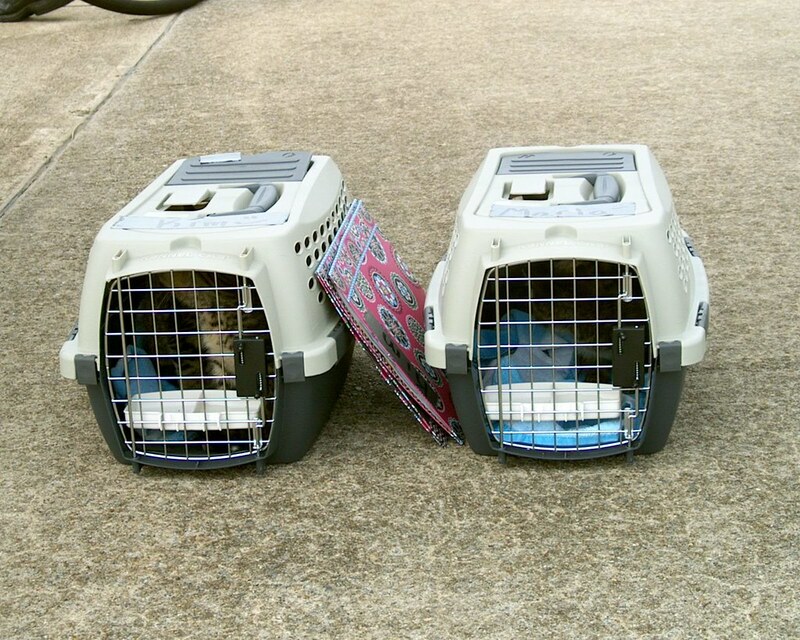 Safely on the ground at KDMW, three of the kitties are now home. Kim and Tiffany are new foster moms, but I think the arrangement may turn out to be more permanent than that. Elliott delivers the darlings to their final pilot of the day - Margery. Margery had the privilege of flying the anchor leg to deliver these darlings to waiting families. Blanco has been settling in nicely on Cape Cod and enjoys the patience and tolerance of his 3 year old brown lab sister, Olivia. Yesterday he went down to a park on Buzzards Bay and spent a good amount of time chasing the waves as they crashed along the shore. He seems reluctant to leave our house as if maybe it is only a stop on his journey, well he’ll be relieved to know it’s his permanent home. Thank you so so much for such a wonderful update on Blanco!! I love thinking about him walking in the park with his new wonderful family and playing in the waves and having the chance to being a much loved family member for the first time in his life. 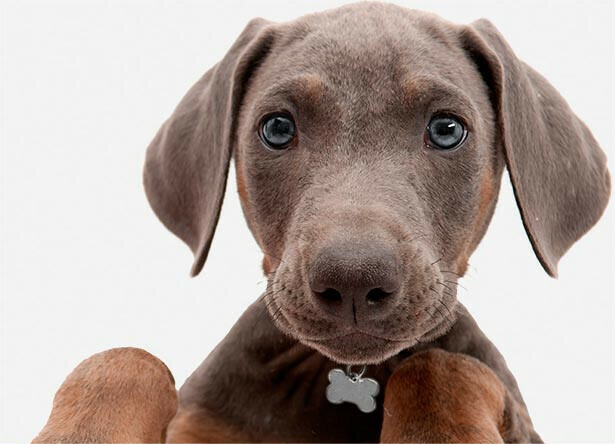 Sounds like he's going to have lots and lots of walks in the park and playing in the waves in his future and I know that he'll enjoy having his big sister Olivia by his side for puppy company. He is such a joy and he is very special to me. Thank you so much for loving him so much and changing his life. You and your wife have done an incredible thing and I am, and always will be so grateful to you for giving him a home and giving him his very own family!! Please send updates and photos when you can!! Thank you again- a little stray shelter dog that once did not have a place in the world to call his own is no longer homeless. He is home.